Pastors have many roles. They certainly preach on Sundays and they lead Bible Studies and ministries, but one of their unsung roles is counselor. Pastors may talk to husbands and wives about marriage and kids, or to people about substance abuse, or spending or any number of things. One of the most important things a pastor can do though is talk to people about their marriage or their pending marriage. With this in mind I have stockpiled a handful of books on marriage. 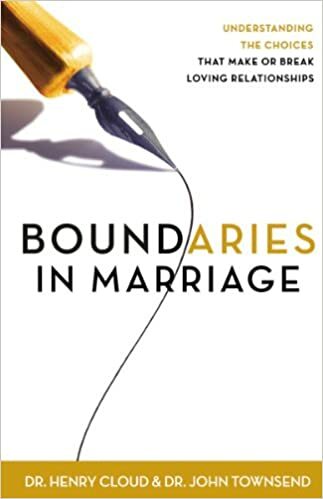 I just finished reading Boundaries in Marriage by Henry Cloud and John Townsend. I do not like everything in this book, but there are some nice points and specific examples that can help married people or those about to get married have Godly marriages and relationships. The authors begin by explaining boundaries. A marriage is made up of two individual people joining together to become one. Beyond those six values are another six kinds of conflict in marriage. I was able to constantly review my marriage as I was reading the book and seeing areas where I have room to grow and improve and also areas where Stephanie can do the same. The book has value, but is not a certain recipe for success. Consider it a tool in your tool box, using the right tool makes repairs much easier. This is another tool a married couple or counselor can use regarding marriage.